McKinney Skunk Removal and Skunk Control from A All Animal Control of Collin County, is common need and we get a lot of calls from homeowners and businesses in Allen, Frisco, McKinney, Plano, Richardson, Wylie, Murphy, TX and nearby cities who are concerned about skunks living too close for comfort. A wildlife professional needs to begin skunk removal and control as soon as there is evidence of them living in your garage, crawlspace, basement, or shed. Skunks frequently dig their way under decks and porches when they are able to see that there is open space on the other side. They can also do a lot of damage to your lawn or garden in their search for grubs and other insects. Skunks also carry diseases which are able to be passed to humans and pets, including rabies. Call for help from your local A All Animal Control Collin County Wildlife Professional before the problem gets even worse at 972-895-7661. McKinney Skunk Control and Skunk Removal should only be attempted by professionals. Do-it-yourselfers often underestimate the distance skunks are able to spray or use the wrong type of cage. Using the wrong type of cage to catch a skunk could lead to you or a family member or pet being sprayed by the animal. A trapped skunk in a window well or elsewhere is a potentially dangerous situation that will require the wildlife professional to risk getting bitten. Your local A All Animal Control of Collin County wildlife professional knows how to handle your skunk problem in the quickest and most humane way possible. Removal of a dead animal from your yard or home and deodorization of the area is another service we provide. Leaving a dead skunk is unsightly and will only make the problem worse by attracting other animals and insects. It needs to be removed immediately. All of these cities experience skunk control and removal problems. 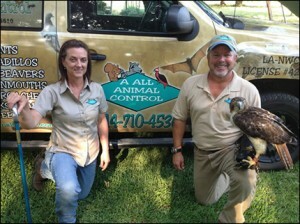 Skunk control and removal services are provided in all of these locations. A All Animal Control of Collin County is your local professional that can get rid of your skunk problem the quickest and most humane way possible.